Christmastime is my favorite season of the year, when our house is filled with the sights and smells of buttery goodness. Every year on Christmas Eve, we celebrate at my aunt’s house with a Feast of the Seven Fishes. 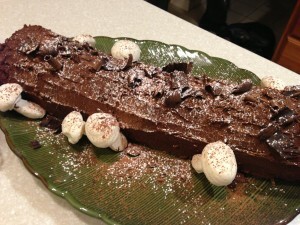 And for the past 5 or so years, I’ve made a Buche de noel to serve at the party. This yule log is the perfect combination of delicate rolled up sponge cake, creamy chocolate ganache, and meringue mushrooms. It’s a challenging adventure each year, and I love making it. 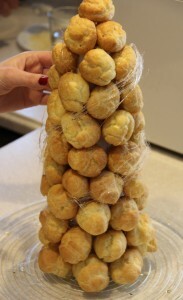 A few years ago, I started to wonder if people were getting tired of my annual treat, so I called my aunt to find out. She jokingly replied that I wouldn’t be allowed in the house on Christmas Eve without a Buche in my hands. I mean…I think she was kidding…but I didn’t dare to find out. But while studying for my pathology final in mid-December 2013, I felt the surge of rebellion. I wanted to try something new, but I also knew my relatives were expecting something as delectable and striking as the yule log. 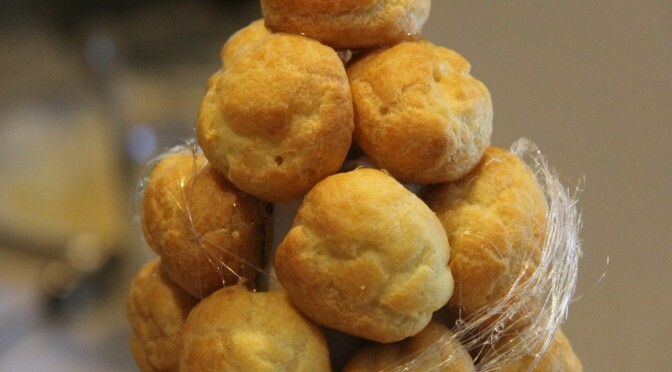 I googled things like “impressive holiday desserts” and “complicated Christmas cake.” Amidst all of the gingerbread houses and fruit cakes, I stumbled upon the perfect dessert – a dazzling tower of cream puffs decorated in spun sugar. Behold, the croquembouche.